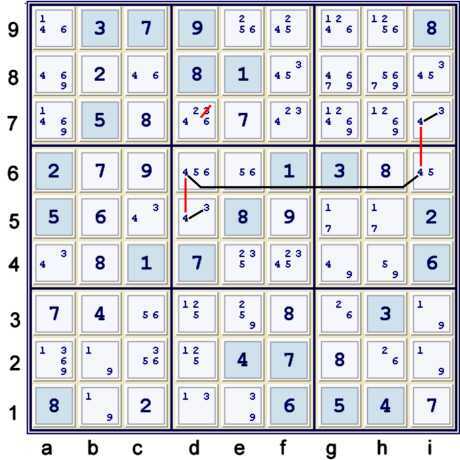 The following illustrated proof for the diabolical & extreme Tough Sudoku of April 12, 2007 employs a wide array of techniques. Of special import for this puzzle are Advanced Forbidding Chains . By this I mean that a technique, including possibly a Forbidding Chain (also called Alternating Inference Chain (AIC) is used as an argument in the chain. 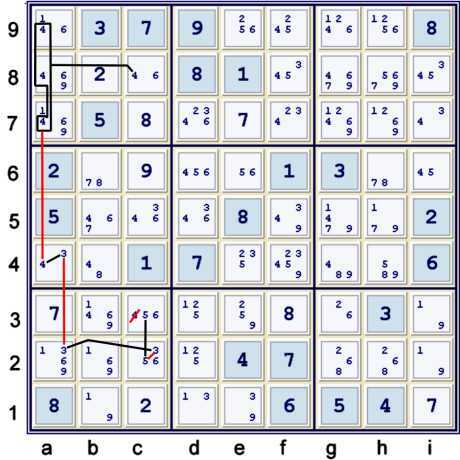 If this is your first visit to this blog, you are strongly encouraged to research how I use Forbidding Chains, as this puzzle is a slight bit hard. Definitions: Most terms used on this page have a defintion somewhere on the defintions page. 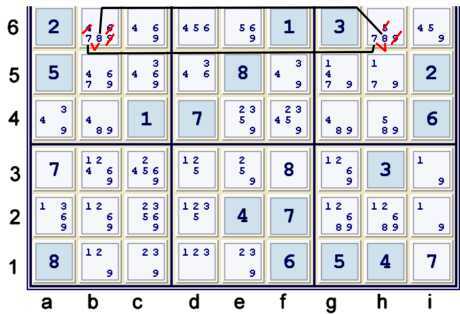 Typically, at this point, I prefer to search for Hidden Pairs before filling in the Possibility Matrix. 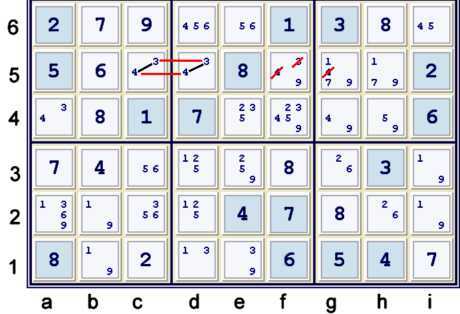 b6=7 == h6=7 -- h6=8 == b6=8 => bh6=78. After making these eliminations, one can solve another cell: c6 = 9% row. A simple forbidding chain like this one reduces to: a2=3 == e1=3, which means that at least one of a2,e1 must be 3. 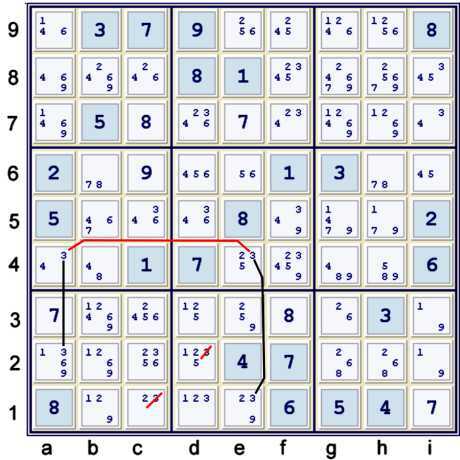 Thus, all the possible 3s which see both of the cells a2,e1 are eliminated. Two more cells are now solved: c1 = 2% cell and then b8 = 2% row, column & box. The first part of the chain, c8=4 == a789=4 is a type of grouped argument that is frequently helpful. One may note that a789=4 == a4=4 would also be a true statement. The fact that the relationship between a789=4 and a4=4 is both a strong inference and a weak inference is of little concern. This is also the case with a4=3 & a2=3. Please review the blog pages on forbidding chain theory if this causes confusion. Illustrated above is the newly uncovered naked pair 34 at cd5. After making the indicated eliminations, f5=9% cell. The naked Pair 19 at bi2 justifies the eliminations shown above. This concludes the first page of this puzzle proof. Some possible headaches, and certainly some very interesting stuff, can be found on the next page.